We now offer birthday parties for both children and adults. If you’re looking for something different, to make a day to remember, look no further! We can host your birthday, family get together or party for any other occasion you can think of. Children’s Parties. We can offer you even more than just the delicious sandwiches, juice and cake from our award winning café team. We have slime making, fairy cake baking and everything in between to make your child’s birthday MAMMOTH! Purple Prickles and Poisonous Warts – act out a well loved story with nut and spoon races, hunt the owl, make a mask, pin the tail on the fox and play “Snakes and Ladders”. The Three Pigs – see if you can build a house of sticks that can stand up to huffing and puffing and they enjoy a toasted marshmallow. A ratio of one adult to two children is needed for this session! Men of Sticks and Lady Loves – hear a well loved story, go outside, find just the right sticks and make a stick man or stick lady love to have adventures and take home with you. 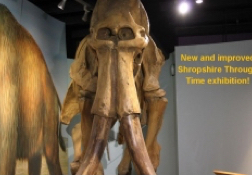 Mega Mammoth – find out about the Shropshire Mammoth, learn about fossils and then make one to take home. The Slime Workshop – Discover why slime is so important in nature and make some to take home. Stars Wars Academy – Do you have what it takes to become a Jedi? You will be put through your Jedi trials – self-discipline, agility, lightsabre training. Hogweed’s School of Magic – an invitation for young witches and wizards to brush up on their herbology, communication potion and spell making skills. Fairy Cake or Pizza Making – choose to make fairy cakes of different flavours and colours or individual pizzas with your choice of toppings. Prices start from £95.00 for up to 8 children, £6.00 per additional child up to a maximum of 15 children. Younger siblings who are not taking part in the activity are welcome to attend free of charge. Your package also includes entrance to the Shropshire Hills Through Time Exhibition. While following Tusker’s Timeline Trail children can learn how to be landscape detectives during the visit, answering quiz questions as they go. We advise a minimum of three adults to accompany the children through the exhibition. This will help them to get the most from their visit. 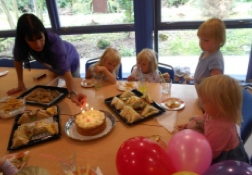 At a time to suit you, the children can enjoy a birthday tea which includes sandwiches, sausage rolls, crisps, flapjack or shortbread and squash all provided by our fantastic catering team in a private room. Another thing you won’t have to worry about, our cafe is able to cater for all dietary requirements. We will sort everything for you, all you need to do is send out the invitations and bring the cake! Adult sessions TO BE ADDED. 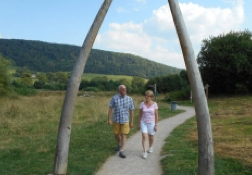 Find out about the chilling Ice Age and meet our mammoth – a full size replica of the skeleton found at Condover, near Shrewsbury. Our delicious home-cooked meals are prepared using local produce to bring you a true taste of the Shropshire Landscape, with Sunday lunches a speciality. There are regular family events and workshops throughout the school holidays to keep children and adults amused and entertained as well as on-going adult workshops and cookery courses. FREE ENTRANCE to 30 acres of riverside paths, wild flowers and woodland all in the shadow of an Iron Age hillfort. 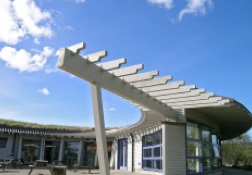 Shropshire Hills Discovery Centre is operated by Grow Cook Learn, a registered charity, connecting people to the food, history and landscape of the Shropshire Hills, providing opportunities to local people and visitors to learn and discover. Registered Charity in England Number 1158795.